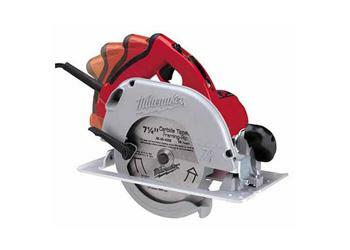 The TILT-LOK handle on Milwaukee's 6390-20 is the most revolutionary concept for circular saws in years. The eight position cushioned top handle adjusts to any cutting application maximizing comfort and control. Weighing in at 10.4 pounds and delivering 3.25 maximum horsepower, this tool offers the best power to weight ratio in the industry. The blade can bevel to 50 degrees and offers superior visibility and a clear sight line from either side. Helical steel gears and a 22 amp switch are just two of the features that ensure the Milwaukee's reputation for durability.